For 38 years, Dr. Giovanni Garcia has been a professor at Universidad de Antioquia’s school of medicine in Medellin, Colombia. He is also the chair, and head of vascular surgery at Hospital Universitario San Vicente Fundación —one of the top 20 hospitals in Latin America, and the leading hospital in Medellín. In 2016, in recognition of his academic, scientific and professional work, the Colombian Society of Vascular Surgery and Angiology recognized Dr. Garcia as a “Master of Vascular Surgery.” Dr. Garcia trained as a vascular surgeon at the University of Medicine and Dentistry of New Jersey (UMDNJ) —now affiliated with Rutgers University, and at the Middlesex Hospital at the University College London, UK. 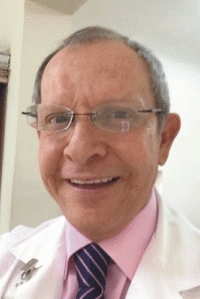 Dr. Garcia has been a professor for more than 38 years at Universidad de Antioquia; he co-created its residency program in vascular surgery in 1995 and also at Hospital Universitario San Vicente Fundación. He founded the Antioquia State Society of Vascular Surgery and Angiology, and was twice its president. He was the president of the Colombian Society of Vascular Surgery and the Association of Spanish Speaking Vascular Surgeons in Latin America. Dr. Garcia belongs to international associations such as CELA (Endovascular Surgeons of Latin America), in which he was a director. Dr. Garcia is currently involved in four research projects and has authored 53 publications. Universidad de Antioquia has recognized Dr. Garcia for his work and clinical accomplishments as a transplant surgeon for over 18 years. Universidad Valladolid in Spain also recognized Dr. Garcia as Honorary Professor of Vascular Surgery. El doctor García ha sido objeto de reconocimientos por la Universidad de Antioquia y el Hospital Universitario por ser cirujano de trasplantes durante 18 años, y por ser profesor honorario en la cátedra de Cirugía Vascular por la Universidad de Valladolid en España y la Universidad de Londres en Inglaterra.